Sea World Orlando is a magnificent theme park, and it would be my first choice to visit again and again. 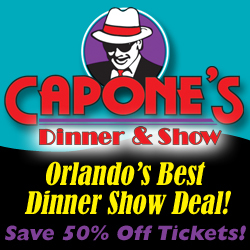 It is fun for all age groups and less stressful than all the other Orlando theme parks. The first attraction is the wildlife both interactive and in the many shows. The highlight is Shamu – Sea Worlds’ killer whale who performs with his trainers. It amazes me how intelligent the whales are and the trainers skills. Sea World Orlando offers additional sea life shows including the highly intelligent and entertaining dolphins. The whale and dolphin shows are definitely the highlights of Sea World’s shows so be sure to plan them into your day. 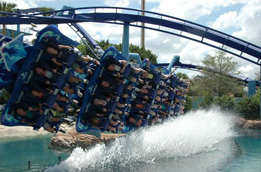 Sea World Orlando also offers a nice selection of rides including roller coasters just as frightening as Islands of Adventure but there are fewer of them. They also have tamer rides the entire family can enjoy. Seasonal firework shows are another aspect Sea World offers. ORLANDO TOURIST TIP: you can enjoy the fireworks lakeside at Sea World’s shopping and dining district in the park. Look for deals on Sea World tickets. Don’t pay gate price unless it’s peak season. Sea World truly is fun for everyone! For more information about Sea World, visit their web site, or type in ‘Sea World’ in our search (top right) to read more articles about this theme park. Feel free to leave a response below about your visit to Sea World and share your tips and experience! The Magic Kingdom at Walt Disney World drastically changed Orlando forever. The great Walt Disney was the visionary that made it happen, what a shame he didn’t live long enough to see his dream. The second park at Walt Disney World EPCOT was in the early planning when he died. Although it didn’t match his exact early ideas the basic principal and many aspects of the park were his. In recent years and always moving forward the imagineers at Disney have been continuously working to make the Magic Kingdom the Grand Dame of Orlando theme parks as relevant and enjoyable as when it first opened. Countless older attractions at the park have been updated with the newest technology and innovation meeting the desires of the ever more tech savvy kids of today. Another nice thing about the Magic Kingdom is that it offers something for everyone. So if you have teens and younger children you can let the teens go do their own thing for a while, if you are comfortable with this. The Magic Kingdom has always provided a safe enviorment. Your kids are more likely to get hurt on a ride (that rarely happens) then be the object of foul play. The Magic Kingdom holds the throne for the most visitors annually in the United States and has done so for many, many years. So if you go, here are some tips for maximizing your visit. Orlando Tourist Tip: If you go to the park in the morning be sure and use the monorail for the fastest access from the ticketing to the park. Depending upon what time you leave the park and how large the crowds are leaving at the same time you might want to take the ferry from the park to ticketing center and parking. It can be faster if crowds are heavy as the monorails will be jammed after fireworks. It’s also a nice way to end your day riding a period reproduction of a very large ferry boat on a gorgeous lake. Even if it’s not busy when you are leaving; it’s a relaxing way to end your day at the parks.